OSF is easy to use for your PHP application development and offers easy learning curve to build and manage your apps. The OSF is easy to use for your PHP application development and offers an easy learning curve to build and manage your apps, in matter of minutes. On this page, you will find a few easy steps to start using the OSF. PHP5 with PHP Data Object (PDO) enabled, with any relational database that is supported by PDO. For more details about PDO, please refer to the official documentation. 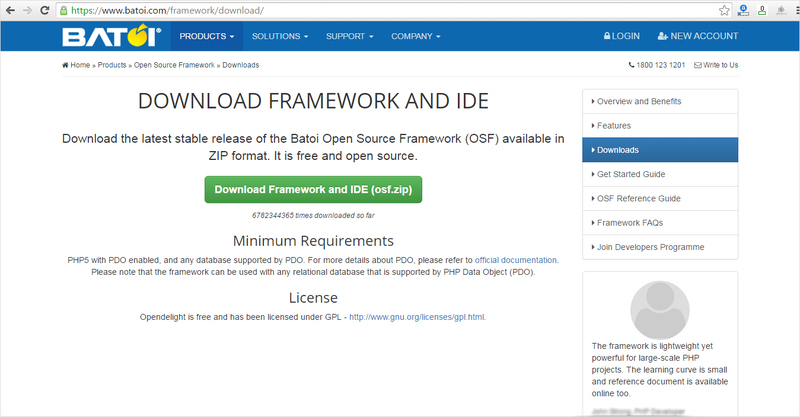 Download the latest stable release of the Batoi OSF in the ZIP file from the Download page. Installing the OSF is quite easy and fast. Please follow the instructions below to install the OSF - a task of a few minutes. Download the OSF ZIP from the Download page and unzip into any folder or subfolder in your webroot ("webroot" is the parent folder or directory in your PC or server which can be accessed through http). Go to the URL http://your-domain/folder1/folder2/.../folderN/osf/install. 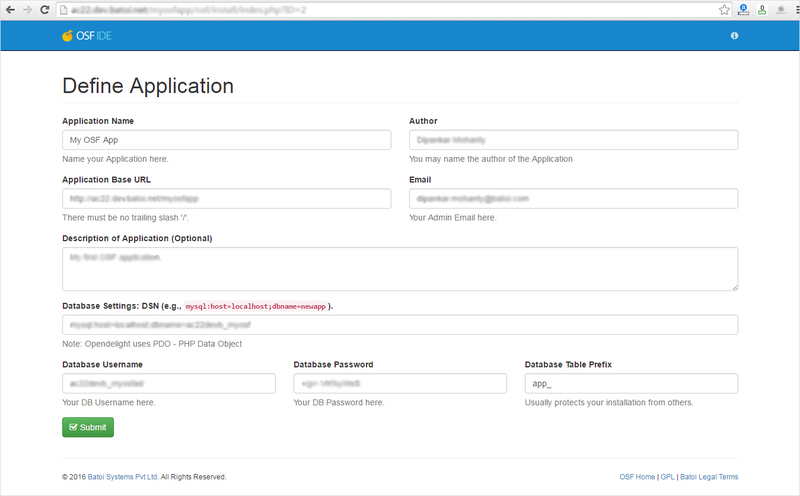 Upon doing so, the system will open the "Application Setup" page as shown below. Click on the "Click to begin Setup" button as shown above. Upon doing so you will be taken to a page to fill in the details of your application as shown below. Fill in the requisite details and click the "Submit" button. 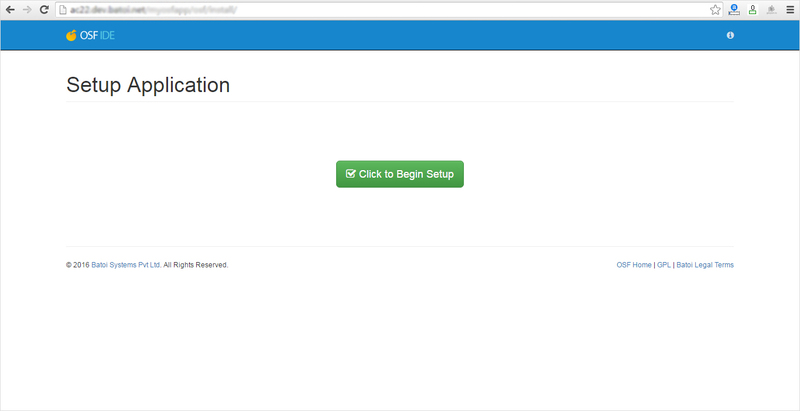 Upon doing so the system will install the application for you and you will land on a success screen with the access details of your appliication as shown below. 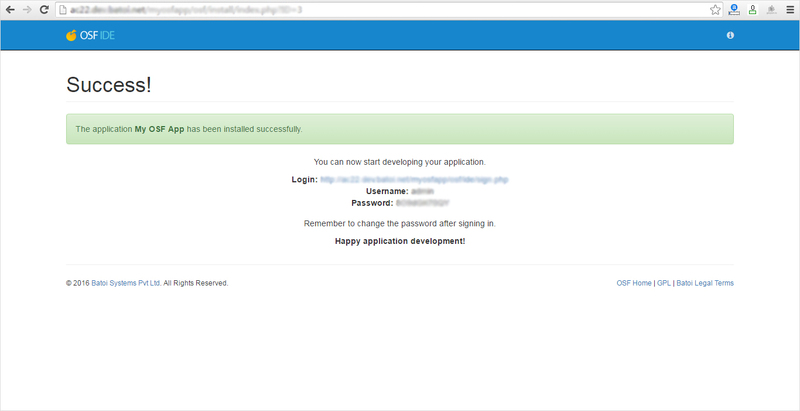 Check your application URL (where you are going to develop your new application) is correct. If you find any disparity, please rectify at this point. Make sure that the URL does not have a / at the end. The username admin (case-sensitive) is the super user who can access the OSF IDE and can develop, manage and access entire application. This user gets such a right through a default role assigned to it - Administrator. Neither this username nor its association with the role Administrator can be modified. Table-prefix will be a string that will be preppended to each table in the database. In case of the OSF system tables, they will be automatically done. In case of the new tables you create, make sure that you do the same. Once you are done with the development of the application, you can remove the /ide folder on your live site if you wish - this will not affect the working of your live site in any way. You can always upload this folder at any later stage if you would like to modify your application. Once you install, you are done with your application setup, security procedures, access privilege settings and signin forms. Now, signin at your OSF IDE to start developing your application. You can find all requisite information on the OSF Reference Guide available online to read and download. The framework is lightweight yet powerful for large-scale PHP projects. The learning curve is small and reference document is available online too.